THE San Miguel Beer freight train claimed its latest victim on Saturday night, ramming into Talk ‘N Text with a 97-84 victory at the Smart-Araneta Coliseum to move on the verge of an outright semifinal berth in the Smart Bro-PBA Philippine Cup. The Beermen stayed on the winning track, stretching their streak to seven games and winning their ninth in 10 games to tighten their grip on the top spot, although they still need to beat Alaska in their final game of the elimination round. Arwind Santos, June Mar Fajardo, and Alex Cabagnot did most of the heavy lifting for the Beermen, who kept the Tropang Texters from putting up their own winning streak as they dropped to a 5-4 win-loss card. Santos delivered his best offensive game of the season, tallying 30 points on 12-of-20 shooting, along with 12 boards and three assists, while Fajardo registered 22 points, 15 boards, and five blocks to bounce back from his worst offensive game of the season. Cabagnot facilitated the offense with aplomb anew, chipping in 21 markers, eight boards, six assists, three steals, and never turned the ball over in 39 minutes. 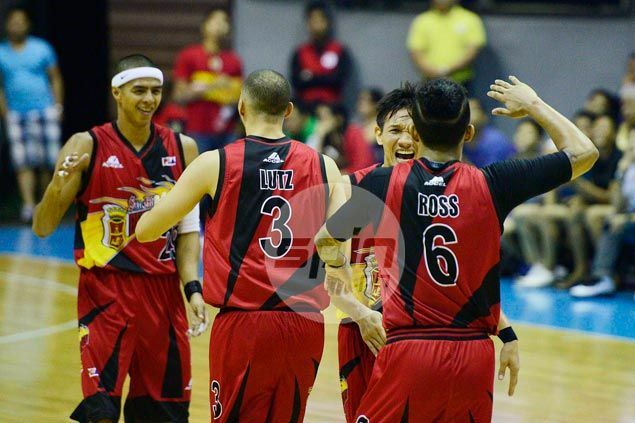 Behind the trio, the Beermen broke away early and never looked back as they maintained a double-digit cushion that grew to as many as 19 points, 62-43. The Beermen enjoyed the blowout despite still missing the services of inured star sniper Marcio Lassiter, who skipped his third straight game due to a hamstring injury. Jayson Castro fired a team-high 20 points, but shot just 6-of-19 from the field as the TNT star’s shooting woes continued.